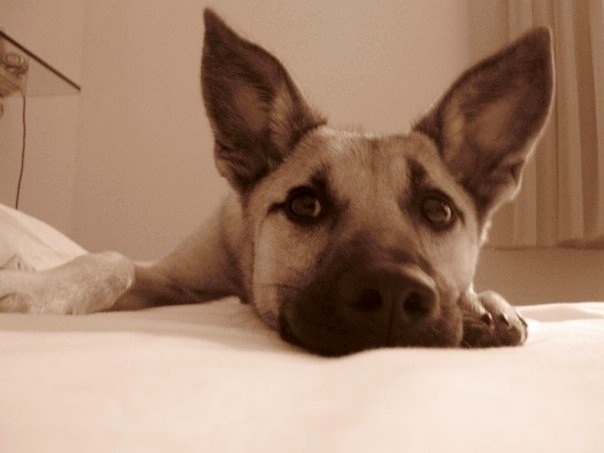 Does your dog worry when they are left alone? If your immediate reaction to the question above was “no”, it might just be necessary to think again. 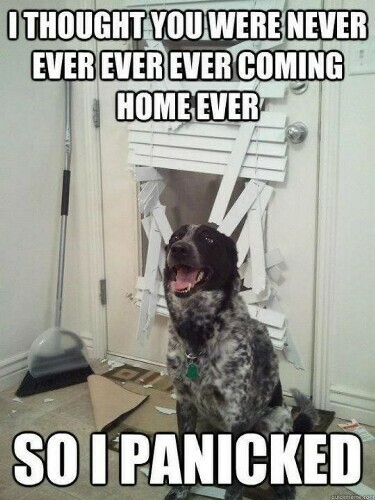 Separation Related Behaviour is the name given to those behaviours dogs exhibit when left alone. These needn’t always be bad – they can be positive – but it is typically those that are negative and become a problem for both dog and owner that attract most attention – manifesting as “Separation Related Distress”. Identifying symptoms of Separation Related Distress is usually easy. However, connecting the dots and diagnosing the cause can be more difficult as the signs can also result from other causes (illness, pain, other anxieties). Other signs suggestive of Separation Related Distress include anxiety when you are getting ready to go out. For example, dogs can follow their owners around the house whilst panting and seeking attention when you are putting on your shoes, picking up keys etc. They will have identified these as activities that precede a negative event (their owner leaving) and are reacting to them. Finally, an overly-excited greeting when you return may also be a sign your dog has been anxious whilst left alone. But surely it’s not that common? These types of behaviours are far more common that most owners realise, with at least 1 in 5 dogs exhibiting Separation Related Distress when left alone. Concerningly, this statistic comes from two UK-based studies based on owner-submitted reports meaning it only includes people who identified their dog has an issue. Even more worrying was a small-scale study by Dr Casey (University of Bristol, UK) that filmed 40 dogs when left alone and reported a whopping 80% as exhibiting Separation Related Distress. But how can I tell if my dog is distressed? The easiest way to tell if your own dog suffers from Separation Related Distress is to video them when he or she is left alone. Hopefully you will see him or her chewing on a Kong, settling into their bed and falling asleep. If they don’t do this though, it is not a total disaster – help is at hand. If you are worried your dog may be suffering from Separation Related Distress, the first step is to book an appointment with your Veterinarian for a full health check. With medical causes eliminated, an appointment to see a qualified Behaviourist or Behaviour Veterinarian will allow for a full assessment followed by development of a treatment plan. For further advice or to discuss a particular case please do not hesitate to contact Dr Julie at Life on Four Legs. 1. Bradshaw, J.W.S., Blackwell, E.J., Rooney, N.J. and Casey, R.A. (2002). Prevalence of separation related behaviour in dogs in southern England. In: Proceedings of the 8th ESVCE Meeting on Veterinary Behavioural Medicine, Granada, Spain. Eds. J. Dehasse, E. Biosca Marce. Publibook, France. Pp 189-193. 2. Bradshaw, J.W.S., McPherson, J.A., Casey, R.A. and Larter, I.S. (2002). Aetiology of separation related behaviour in the domestic dog. Veterinary Record, 151, 43-46.